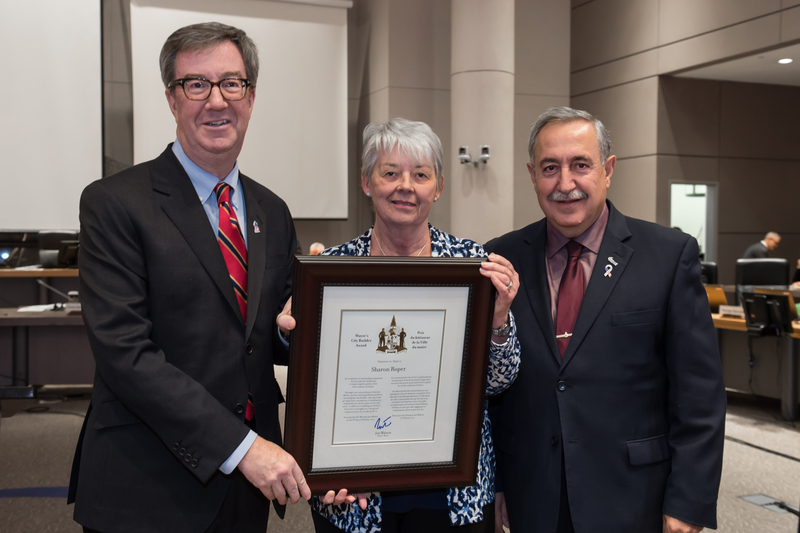 Ottawa – Mayor Jim Watson and West Carleton-March Ward Councillor Eli El-Chantiry presented the Mayor’s City Builder Award to Sharon Roper at today’s City Council meeting. Sharon is a dedicated contributor to the leadership and operation of the West Carleton Food Access Centre. As a long-standing volunteer and community member, she has dedicated countless hours and years to ensuring that no resident of Carp and the surrounding West Carleton area goes without. In addition to the direct work that she herself does, Sharon also plays a role in the training and encouragement of others who volunteer in the community. The food bank serves the needs of 66 families in West Carleton and Sharon keeps the shelves full. She is a wonderful role model working with local students and Pathfinders. For years Sharon has been the coordinator of the Angel Tree Program in West Carleton. Working with local businesses, she starts well before Christmas to distribute angel trees to collect age appropriate toys for families in West Carleton. The toys are collected, sorted and distributed with food hampers just before Christmas. Last February, there was a water pipe problem at the local senior’s residence and the water had to be shut off. Sharon saw a need and took action, doing laundry for several of the seniors. This is the Sharon who is greatly respected and admired.